Drought reduces tree growing season length but increases nitrogen resorption efficiency in a Mediterranean ecosystem Drought reduces tree growing season length Raquel Lobo-do-Vale et al. Mediterranean ecosystems are hotspots for climate change, as the highest impacts are forecasted for the Mediterranean region, mainly by more frequent and intense severe droughts. Plant phenology is a good indicator of species' responses to climate change. In this study, we compared the spring phenology of cork oak trees (Quercus suber), an evergreen species, over 2 contrasting years, a mild year (2004) and a dry year (2005), which was the most severe drought since records exist. We evaluated the timing of occurrence, duration, and intensity of bud development, budburst, shoot elongation, trunk growth, and leaf senescence (phenophases) and assessed the nitrogen resorption efficiency from senescent to green leaves. The temperature was the main driver of budburst. Nevertheless, water had the main role of constraining all the other phenophases by strongly reducing the growing season length (−48 %) and consequently the tree growth. Basal area increment was the most affected growth variable (−36 %), although it occurred at a similar rate in the 2 years. Shoot elongation was also reduced (−21 %), yet elongation occurred at a higher rate in the dry year compared to the mild year. Leaf senescence during the bulk period was higher in the dry year, in which leaves were shed at the same rate over a longer period. Nitrogen concentrations in green and senescent leaves were affected by drought and nitrogen resorption efficiency increased remarkably (+22 %). Our results highlight the importance of studying different phenological metrics to improve our understanding of the ecosystem's responses to climate change. The faster dynamics observed in shoot elongation, while all other phenophases developed at the same rate, indicate that leaf area development is privileged in cork oak. Water availability was the main driver of spring growth in this Mediterranean ecosystem; however, growth may be affected by complex interplays between precipitation and temperature, such as higher temperatures during dry winters or heatwaves during spring, that are likely to result in water stress. Longer studies are needed to disentangle those interplays. Finally, a higher nitrogen resorption efficiency in response to drought appears to be an adaptive trait that mitigates the limitation in nitrogen uptake by the roots during drought and contributes to improving tree fitness in the short term but will probably exert a negative feedback on the nitrogen cycle in the long term, which might affect the ecosystem functioning under the forecasted droughts. Lobo-do-Vale, R., Kurz Besson, C., Caldeira, M. C., Chaves, M. M., and Pereira, J. S.: Drought reduces tree growing season length but increases nitrogen resorption efficiency in a Mediterranean ecosystem, Biogeosciences, 16, 1265-1279, https://doi.org/10.5194/bg-16-1265-2019, 2019. Plant phenology is an important indicator of the ecosystem's responses to climate change (Jeong et al., 2011; Polgar and Primack, 2011; Richardson et al., 2013; Han et al., 2018). Shifts in plant phenology have broad consequences for ecosystems, not only directly through changes in the cycling of carbon, water, and nutrients, but also indirectly through feedbacks on the climate system (Diez et al., 2012; Richardson et al., 2013; Tang et al., 2016; Han et al., 2018), which in turn may strongly influence ecosystem productivity (Tang et al., 2016). However, the response of species phenology to climate change is complex and highly variable, depending on the species, spatio-temporal scales (seasonal or annual), or main climate driver (precipitation, temperature, or both) (Penuelas et al., 2004; Polgar and Primack, 2011; Diez et al., 2012; Tang et al., 2016; Gerst et al., 2017). It is critical to have a better understanding of the patterns and climate drivers of the different phenophases in a broader range of tree species (Richardson et al., 2013; Tang et al., 2016; Lempereur et al., 2017). In particular, there is a dearth of information on Mediterranean sclerophyllous species (Misson et al., 2011; Bussotti et al., 2014; Costa et al., 2016) that grow in regions in which the impacts of climate change will be amplified, mainly by more severe and longer droughts (Giorgi and Lionello, 2008; Jacob et al., 2014; Perkins-Kirkpatrick and Gibson, 2017). Temperature is one of the most important drivers of plant phenology (e.g. Pinto et al., 2011; Flynn and Wolkovich, 2018). An earlier budburst and a lengthening of the growing season due to increased temperatures have been reported by many studies (e.g. Peñuelas et al., 2002; Menzel et al., 2006; Gordo and Sanz, 2009; García-Mozo et al., 2010; Jeong et al., 2011). However, it was hypothesized that precipitation may be more important than temperature for the phenology of Mediterranean plant species (Penuelas et al., 2004). Still, available information of the effects of precipitation on phenology is scarce. Few studies indicated that precipitation had an impact on the onset of some phenophases, such as flowering and fruiting (Penuelas et al., 2004; García-Mozo et al., 2010; Swidrak et al., 2013). For tree growth and overall ecosystem productivity, summer drought is the most limiting period (Niinemets, 2010; Lempereur et al., 2017) while precipitation over the growing season determines growth and productivity (e.g. Pereira et al., 2007; Oliveira et al., 2016). Mediterranean trees are plastic and adjust their vegetative activity to the periods when water is available and temperatures are favourable, mainly during spring (Gordo and Sanz, 2010; Misson et al., 2011; Pinto et al., 2011). Both total and seasonal precipitation are important for tree growth (Besson et al., 2014; Oliveira et al., 2016). Costa et al. (2002) suggested that winter precipitation enhanced early spring growth, while Costa-e-Silva et al. (2015) reported reductions in stem growth due to a dry winter. Furthermore, Costa et al. (2016), studying cork oak growth on different sites, identified different sensitivities to climate, showing that cork oak strategies to cope with drought ranged from drought tolerance to drought avoidance. The effect of temperature on tree growth seems to be tightly linked to precipitation (Sardans and Peñuelas, 2013; Oliveira et al., 2016), stimulating growth if warmer temperatures occured in wetter years and having no effect or decreasing growth in dry years. However, it is not clear how these two climatic drivers affect the timing and length of other tree phenophases such as shoot elongation or leaf senescence. For most deciduous and evergreen species, the length of the growing season depends on the timing of budburst in spring but also on leaf senescence in autumn. For example, Jeong et al. (2011), reporting changes in phenology in the Northern Hemisphere suggested that the lengthening of the growing season was due to extended leaf senescence in autumn rather than an earlier budburst. But Han et al. (2018) reported both an earlier spring growth and an extended leaf senescence in European forests. In the Mediterranean region, Gordo and Sanz (2009), in a study with 29 perennial species, reported that an extended growing season was due to an earlier budburst in spring. Shifts in plant phenology can affect the cycling of nutrients that in turn might affect the nutrient availability for plant growth (Richardson et al., 2013). In addition, drought can condition nutrient availability for plant growth, either by decreased litterfall decomposition due to limited microbial activity and/or by limited nutrient uptake by roots due to lower mass flow and diffusion. Retranslocation of nutrients from senescent to new leaves is a key process that contributes to the nutrient conservation in plants, reducing the dependence of plants on soil nutrient availability (Aerts, 1996; Fioretto et al., 2003; Xu et al., 2017; Wang et al., 2018). Nutrient retranslocation typically increases in the Mediterranean tree species before leaf senescence (Sardans and Peñuelas, 2013). Climate is a primary driver of nitrogen resorption efficiency (i.e. percentage of nitrogen that is retranslocated or resorbed, from senescent to green leaves, nitrogen resorption efficiency – NRE) (Aerts, 1996), which is known to globally decrease with mean annual precipitation and temperature (Vergutz et al., 2012; Wang et al., 2018). However, it is not clear whether NRE depends directly on annual precipitation or if the reduced water availability elicits a response in NRE (Brant and Chen, 2015). The reported impacts of drought on NRE are not consistent. Studies with herbaceous species reported drought to either increase (Zhao et al., 2017) or decrease NRE (Drenovsky et al., 2012; Khasanova et al., 2013). Also, no changes in NRE were observed in Australian sclerophyll species between two distinct rainfall zones (Wright and Westoby, 2003). More importantly, in Mediterranean ecosystems, which usually have nutrient-poor soils (Sardans and Peñuelas, 2013), it is not known how increasing drought severity will affect NRE (Sardans and Peñuelas, 2013). Due to a plethora of adaptation strategies that are designed to withstand long periods of water shortage (see a review by Sardans and Peñuelas, 2013), among other particularities, Mediterranean ecosystems are considered exceptional models for studying the effects of climate change (Niinemets and Keenan, 2014; Doblas-Miranda et al., 2015). One important Mediterranean tree species is cork oak (Quercus suber). It is an evergreen tree with short-lived leaves that usually are shed within 1 year (Natividade, 1950; Pereira et al., 1987; Escudero et al., 1992; Aronson et al., 2009), concurrently with spring growth. Like other Mediterranean oaks, cork oak is adapted to the Mediterranean climate, being able to survive summer drought. However, this tree species is showing signs of increasing vulnerability, mostly due to increased drought occurrence and poor management practices (Costa et al., 2011; Camilo-Alves et al., 2013). Cork oak phenological responses to the forecasted increase in severe droughts are still largely unknown. In addition, available studies on cork oak rarely compared nutrient dynamics in green and senescent leaves (Delarco et al., 1991; Andivia et al., 2009). In this study, we discuss the phenophases characterizing the vegetative growing season of cork oak in spring (bud development, budburst, shoot elongation, leaf senescence, and trunk growth) in 2 contrasting years, a mild year and an extremely dry year. Each phenophase is characterized by timing, duration, and growth. Also, the nitrogen resorption efficiency is determined and compared between the mild and extremely dry years. We aimed to assess the effect of the extremely dry year on the cork oak spring phenology and growth. More specifically, we hypothesized that drought would (1) affect the timing of the different phenophases, (2) decrease the length of the spring growing season, negatively affecting growth, and (3) increase the nitrogen resorption efficiency from senescent to new leaves. The study was conducted at Herdade da Mitra (38∘31.664′ N, 8∘01.380′ W, 221 m altitude) in southern Portugal. The climate is typically Mediterranean, with hot and dry summers. The soil is sandy (88.9 % sand, 4.9 % silt, and 6.3 % clay) and slightly acid (pH 4–6), with a low water-holding capacity (∼5 %), and is on a 5 % slope. The experimental area was 0.3 ha. Cork oak (Q. suber) trees were 16 years old. Tree density was 1997 ± trees ha−1. The understory was mostly composed of Cistus salviifolius and C. crispus shrubs, and C3 annual herbaceous species, ending their cycle typically at the beginning of the summer period (June). Spring phenology and growth were monitored over 2 years (2004 and 2005) in 15 trees under natural conditions. Mean tree height at the beginning of the study was 5.0±0.2 m.
We used the experimental set-up of a water manipulation study, as described in Besson et al. (2014), in which three treatments were applied. Dry, ambient, and wet treatments received, respectively 80 %, 100 %, and 120 % of current precipitation. Since rainfall exclusion hardly had any impact on cork oak physiology, we pooled the data from dry and ambient treatments. We excluded the wet treatment because a significant treatment effect was only observed after a single pulse irrigation in late spring, applied as a punctual experiment. For this study, we used only dry and ambient trees that were sampled for both phenological and physiological measurements (n=15). For every variable presented in this study, a previous statistical check (ANOVA) for treatment effects was performed to confirm that the pooling was correctly applied, i.e., no treatment effect was observed. Precipitation (ARG100 rain gauge, EM Ltd., Sunderland, UK), air temperature (T) at 2 m height (Thermistor M841, Siemens, Munich, Germany), photosynthetically active radiation (PAR, LI-190 quantum sensor, Licor Inc., Lincoln, NB, USA) and air humidity (Fischer 431402 sensor, K. Fischer GmbH, Drebach, Germany) were measured in 5 min intervals and 30 min averages recorded with a data logger (DL2e, Delta-T Devices Ltd., Cambridge, UK). Daily mean temperatures were used to calculate the thermal time needed for budburst, or degree-day sum (DDS), i.e., the accumulated temperature above a certain base temperature during a certain period of time (Cannell and Smith, 1983). We considered DDS from 1 January, assuming bud dormancy break (Sampaio et al., 2016), to the budburst date, for each year. The base temperature was set to 6.2 ∘C in agreement with the threshold estimated for cork oak in a previous study in the same region (Pinto et al., 2011). To better characterize interannual variations in climatic conditions, our field meteorological data were compared to a reference period (1971–2000, IPMA, 2018). We also retrieved the Standard Precipitation Evapotranspiration Index (SPEI) from the Global SPEI database (http://sac.csic.es/spei/database.html, last access: 5 June 2018), with a 0.5∘ spatial resolution for the study site to complement climatic conditions, as SPEI is currently the most widespread index for drought analyses in the Mediterranean (Vicente Serrano et al., 2010). Results are presented as hydrological years, as they better represent the seasonality of water availability for tree functioning and growth. The hydrological year of 2004 is comprised between October of 2003 and September 2004 and the hydrological year of 2005 between October 2004 and September 2005. Phenological observations were performed in one randomly marked apical branch, sun-exposed (south-facing), from a total of 15 trees, at least once a week. We registered the days of bud activation (when bud was visible) and budburst (when the shoot emerged). We also registered shoot elongation (when the first leaves unfolded and could be counted), trunk growth onset and cessation, and leaf senescence. Then, we determined bud development duration (as the number of days since bud activation to budburst), shoot elongation and trunk growth duration (as the number of days since the onset to the cessation of shoot elongation and trunk growth). The spring growing season length was defined as the number of days from bud activation to trunk growth cessation. Shoot elongation was measured since budburst with a ruler and leaves counted. Trunk diameter at breast height (dbh) was measured from October 2003 with tree dendrometers (I-802-D1, UMS GmbH, Munich, Germany) at the same time of the day and at least once a month during spring, and basal area increment (BAI) was determined. Since trunk growth in cork oak can be an almost continuous process, depending on climatic conditions (Costa et al., 2002), the onset and cessation of the spring growth period were defined when dbh increments were lower than 0.05 ‰ day−1 (relative to the total tree dbh). BAI was expressed as the percentage of increment relative to the basal area at the onset of spring growth, of each tree in each year. Autumn BAI was used to confirm the end of the growing season of the dry year because the measurement performed at the end of July was inadvertently lost (Fig. S2a in the Supplement). Spring and autumn BAI were regressed against the day of year (DOY). Leaf area index (LAI) was measured at the end of the summer, as described in Besson et al. (2014). Specific leaf area (SLA), calculated as the ratio of leaf area to dry weight, was determined from six discs (with 0.7 cm diameter) collected from three leaves, at least, in each tree, at the onset and at the end of the growing season. For litterfall determination, six sets of three litter traps (0.15 m2 each) were randomly placed in areas including at least two of the studied trees (n=6). Litterfall was collected at least once per month and more frequently during spring, from 13 January 2004 to the end of the study period. Litterfall was separated in leaves and branches, oven dried at 80 ∘C for 48 h and the dry weight of litter leaves was obtained. As litterfall was collected in short time intervals, litter leaves were actually senescent leaves. Here, only this litterfall fraction was reported and named as senescent leaves (in g leaves dry weight m−2 ground). The bulk period of leaf senescence was considered when the fall rate was consistently higher than 0.5 % day−1. Senescent leaves were then used for nitrogen (N) content determination at the onset and at the end of the bulk leaf senescence period, indicating, respectively, minimum and maximum N content in senescent leaves for each year. N determination is described below. To evaluate the intensity of occurrence of the different phenophases, the rate of shoot elongation (cm day−1), trunk growth (cm2 day−1), and leaf senescence ((g m−2) day−1) were calculated at the end of the growing period. To monitor tree water status, leaf water potential was measured at predawn (Ψpd) in three south-exposed mature leaves in each of the 15 trees. Measurements were performed periodically over the study period, with a Scholander-type pressure chamber (PMS Instrument Co., Corvallis, Oregon, USA). To monitor carbon assimilates potentially allocated to growth, daily courses of photosynthesis were measured at 10:00, 13:00 and 16:00 GMT in south-exposed leaves of the selected 15 trees, on the same days as Ψpd, and the maximal rate of photosynthesis (Amax) was obtained. Measurements were performed with two cross-calibrated portable photosynthesis systems (Li-6400, Licor Inc., Lincoln, Nebraska, USA). where [Ngr] was the N content in green leaves and [Nse] was N content of senescent leaves. We used a paired t-test or the non-parametric Mann–Whitney test when test assumptions were not verified to compare the timing and duration of the different phenophases and growth variables between years. To evaluate the effects of drought on [Ngr], [Nse], and NRE, a two-way repeated measures ANOVA was performed, as the same trees and litter traps were repeatedly sampled over the study period, with years (mild and dry years) and phenological stage (onset and cessation of leaf senescence, thus maximum and minimum [Nse]) as factors. The post-hoc Student–Newman–Keuls test was performed when significant factor effects were found. To evaluate the physiological status over the growing season, an F test for slope and intercept comparison was performed between years. The Spearman correlation coefficient was used to evaluate the relationships between variables and when adequate linear regressions were obtained. All statistical analyses were carried out with IBM SPSS Statistics 24 and considered significant when p value < 0.05. Results are presented as mean ±SEM. Figure 1(a) Cumulative precipitation (mm) and (b) smoothed (7 days running average) daily mean temperature (∘C) for the study period. The long-term precipitation and monthly mean temperatures are included as a reference. Total precipitation and distribution patterns of the two hydrological years of the study were distinct (Fig. 1a, Table S1 in the Supplement). In the first year of the study (2004), a wet autumn and winter were followed by a dry spring (−49 % of the long-term average precipitation). In contrast, in the second year (2005), a typically wet autumn preceded an extremely dry winter (−73 % of the long-term average precipitation) and a moderately dry spring (−21 % of the long-term average precipitation). Total precipitation was 607 mm in 2004 and 410 mm in 2005. Indeed, 2005 was the driest year in the last 140 years in the south-western Mediterranean (García-Herrera et al., 2007; Caldeira et al., 2015). The SPEI computed on a 6-month period prior to the growing season (March) was, respectively for 2004 and 2005, −0.4 (mild drought) and −1.7 (severe drought) (Banimahd and Khalili, 2013; Mendes et al., 2016). For these reasons, the studied years will henceforth be referred to as mild and dry years. Regarding temperature (Fig. 1b), the mild year was slightly warmer than the dry year (mean annual temperatures were 16.3 and 15.3 ∘C, respectively; Table S1), mostly due to the occurrence of an unusually cold winter during the dry year. Compared to the long-term average, both years presented cooler autumns and winters and warmer springs and summers. From March to May, mean air temperatures were higher in the dry year compared to the mild year. In June, mean air temperatures were 25.4 and 22.8 ∘C, respectively for the mild and dry years. The degree-day sum (DDS) until budburst was not significantly different between years (p > 0.05, 461±13 and 431±19 ∘C for the mild and dry years, respectively; Fig. S1b). The onset of the bud development and budburst were significantly delayed in the dry year (p<0.001) in comparison to the mild year, with no significant reduction in the bud development duration (p > 0.05, 18±2 and 16±2 days for mild and dry years, respectively; Fig. 2). Shoot elongation, consequently, started later in the dry year (p<0.001) but ended earlier than in the mild year (p<0.001), leading to an important shortening of the shoot elongation period in about 42 days (p<0.001, 66±2 and 24±2 days for mild and dry years, respectively; Fig. 2). Figure 2Timing of the onset and cessation of bud development (bud active), budburst, shoot elongation, trunk growth, and leaf senescence in the 2 contrasting years. The bars represent the duration of each phenophase from the first to the last observation, in spring (n=15). Significant differences between years in the timing and duration of the different phenophases are shown in Table S2. Significant differences were also observed in the timing and duration of trunk growth between years. Trunk growth started slightly later (p > 0.05) and ended significantly earlier (p<0.001) in the dry year than in the mild year, thus showing a significantly shorter trunk growing period (p<0.001, 88±3 and 57±2 days for mild and dry years, respectively; Fig. 2). As a consequence, the spring growing season length was dramatically shortened (p<0.001, −48 %). It is noteworthy that all trees ceased trunk growth within the same week in both years (Table S2). The bulk of the leaf senescence period was significantly delayed (p<0.05) and was longer in the dry year (p<0.05, 53.0±1.3 vs. 78.0±0.0 days in the mild and dry years, respectively, corresponding to 50.9±2.3 % and 76.1±2.6 % of the total leaf senescence; Figs. 2 and 3). Figure 3Growth dynamics in the mild and dry years, from January to December. (a) Budburst (%). (b) Shoot elongation (cm). (c) Number of leaves per shoot. (d) Basal area increment (BAI, %). (e) Senescent leaves (g m−2). Values are mean ±SEM (n=15). Along with the delay in the studied phenophases of the cork oak trees in the dry year, changes in their dynamics were also observed (Fig. 3). Budburst, despite the significant starting delay in the dry year, had similar development dynamics in both years (Fig. 3a). Shoot elongation, which started after budburst (Fig. 3b), had a faster development in a shorter period in the dry year, with a fast build-up of new leaves (Fig. 3c). Spring trunk growth (BAI) exhibited a similar pattern in both years, ceasing growth earlier in the dry year (Fig. 3d). 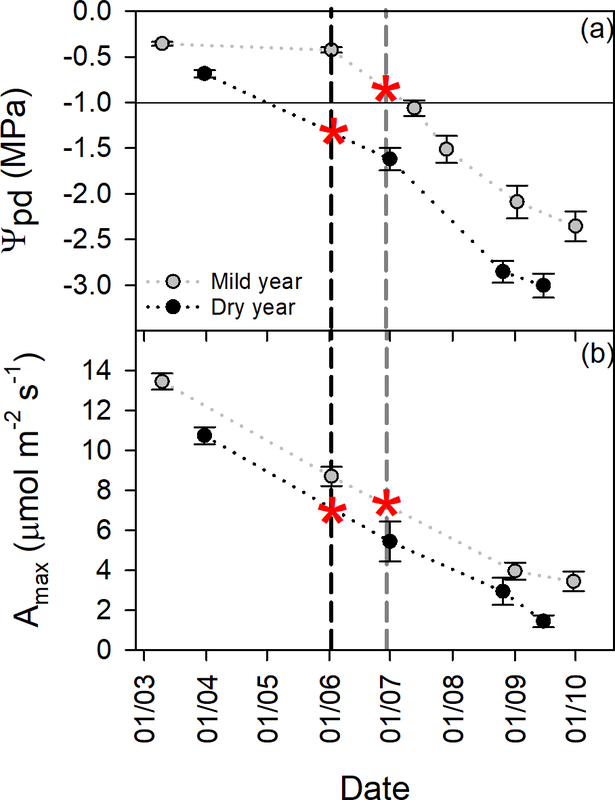 Leaf senescence was the most decoupled phenophase between years, with a later start in the dry year, but then progressed almost in parallel with the mild year (Fig. 3e). In the mild year, the bulk of leaf senescence finished before shoot elongation and trunk growth cessation. In contrast, in the dry year, the bulk senescence period was extended beyond the growing season (Figs. 2 and 3). In the dry year, the shoot elongation rate was significantly higher than in the mild year (p<0.001, 0.39±0.07 and 0.85±0.16 cm day−1 for mild and dry years, respectively). In turn, no changes were observed in the rate of BAI (p > 0.05, 0.049±0.005 and 0.050±0.006 % day−1 for mild and dry years, respectively) nor in leaf senescence rate (p > 0.05, 1.62±0.16 and 1.69±0.12 g m−2 day−1 for mild and dry years, respectively). Figure 4Growth variables evaluated at the end of the growing season in the mild and dry years. (a) Shoot length (cm). (b) Number of leaves per shoot. (c) Basal area increment (BAI, %) expressed as the percentage of basal area at the beginning of each year. (d) Senescent leaves (g m−2). (e) Leaf area index (LAI, leaves m2 per ground m2). (f) Specific leaf area (SLA, g cm−2). Values are mean ±SEM (n=15). Significant differences between years are indicated when * p<0.05, ** p<0.01, *** p<0.001. Overall tree growth was extremely hindered by drought (Figs. 3 and 4). Shoot elongation was significantly reduced in the dry year with new shoots being shorter (−22 %, p<0.05; Fig. 4a) and producing proportionally fewer leaves (−21 %, p<0.05; Fig. 4b), which was also corroborated by the absence of a significant difference in the internode length between years (p > 0.05; Fig. S3). BAI was also significantly lower in the dry year, showing the highest reduction among the evaluated growth variables (−36 %, p<0.01; Fig. 4c). Leaf senescence was higher in the dry year (p<0.001; Fig. 4d), yet LAI was not affected (p > 0.05; Fig. 4e). SLA was strongly reduced in the dry year (−23 %, p<0.001; Fig. 4f). Shoot elongation period was positively correlated with trunk growth period (r=0.83, p<0.001; Fig. S4a). Significant correlations were also found between BAI and shoot length, either when BAI was considered as a percentage of initial basal area (r=0.43, p<0.05; Fig. S4b) or as absolute growth, in cm2, (r=0.57, p<0.001; Fig. S4c). Trunk growth duration was positively correlated with spring BAI (%, r=57, p<0.01). Shoot length was positively correlated with SLA (r=0.48, p<0.01; Fig. S4d). Figure 5Tree physiological status over the growing season in the mild and in the dry year. (a) Predawn leaf water potential (Ψpd, MPa). (b) Maximal photosynthetic rate (Amax, µmol m−2 s−1). Vertical dashed lines represent the mean day of growth cessation for mild (grey) and dry (black) years. Red asterisks are indicative of the interpolated Ψpd and Amax at growth cessation. The horizontal black line is a reference for the reported threshold of Ψpd (−1.0 MPa) for growth cessation in cork oak (Pereira et al., 1987). Values are mean ±SEM (n=15). 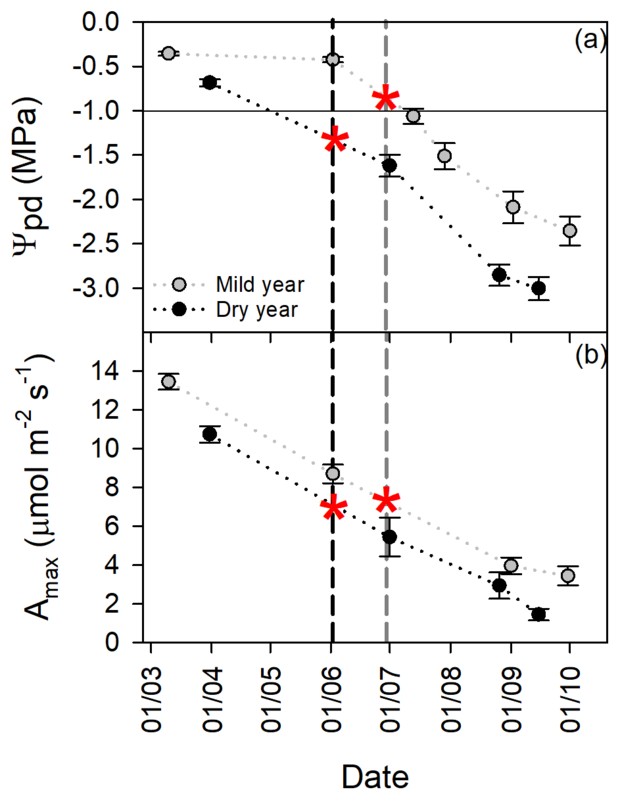 Drought significantly decreased leaf water status (p<0.0001; Fig. 5a). Predawn leaf water potential (Ψpd) over the growing season was lower in the dry year than in the mild year but started to decrease earlier. Then, Ψpd decreased in parallel, as indicated by the absence of significant differences between regression slopes (p>0.05). Leaf carbon assimilation was also affected by drought (p<0.01; Fig. 5b). Maximal photosynthetic rate (Amax) was higher at the beginning of the growing season in both years, decreasing similarly as drought stress progressed (similar regression slope, p>0.05). Growth cessation, as indicated by the red asterisks in Fig. 5a, occurred at lower Ψpd in the dry year than in the mild year. Indeed, interpolated Ψpd values were −0.84 and −1.33 MPa for the mild and dry years, respectively. Interestingly, the interpolated Amax at growth cessation was similar in the studied years, as indicated by the red asterisks in Fig. 5b. BAI was weakly but positively related to Amax at the onset of the growing period (BAI (%) = −0.777 + 0.357 March Amax, r2=0.18, p<0.05; Fig. S5). Figure 6Nitrogen dynamics evaluated at the onset and end of bulk leaf senescence period in the mild and dry years. (a) Nitrogen concentration in green leaves ([Ngr], mg g−1). (b) Nitrogen concentration in senescent leaves ([Nse], mg g−1). (c) Nitrogen resorption efficiency (NRE, %). Values are mean ±SEM (n=6). Significant differences between years are indicated when * p<0.05, ** p<0.01, and *** p<0.001. Nitrogen concentration in green leaves was significantly different between years (p<0.01; Fig. 6a), mostly due to a significant reduction in [Ngr] at the onset of bulk leaf senescence period in the dry year. Mean [Ngr] was 16.1±0.3 and 15.0±0.2 mg g−1 in the mild and dry years, respectively. The [Nse] decreased significantly in the dry year (p<0.01; Fig. 6b) and notably over the senescence period (p<0.001; see also Fig. S6 in which the onset of the leaf senescence is noticeable with a steep decrease in [Nse] over time). The observed changes in [Nse] led to a significant increase in NRE from the onset to the end of the leaf senescence period (p<0.001) and, more importantly, in response to drought (+22 %, p<0.01; Fig. 6c). Furthermore, NRE was explained by [Nse] (NRE = 97.19–6.13 [Nse], r2=0.97, p<0.0001; Fig. S7). The timing of budburst of cork oak trees (Fig. 2) was determined by DDS as previously shown in other studies (e.g. Pinto et al., 2011; Sampaio et al., 2016). 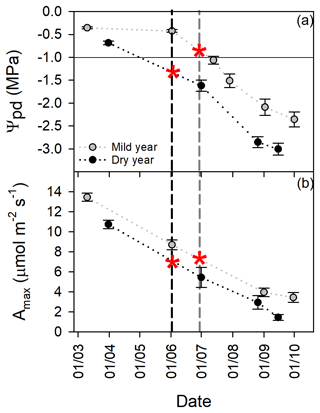 The DDS until budburst was not significantly different between years (Fig. S1b). Nevertheless, budburst was delayed in the dry year due to the colder temperatures observed during the winter and the accumulated thermal time was only reached after the increase in temperature in the early spring. The importance of temperature on budburst, either cumulative (DDS) and/or early spring temperature, has been highlighted in several studies (e.g. Menzel et al., 2006; Richardson et al., 2006; Vitasse et al., 2009; García-Mozo et al., 2010; Körner and Basler, 2010; Pinto et al., 2011). Pinto et al. (2011) reported that the only variable related to budburst date of adult cork oaks was air temperature, in particular the average daily temperature 1.5 months prior to budburst. In a study across Europe, the timing of budburst was found to be highly correlated with the temperature of the preceding month (Menzel et al., 2006) and in a hardwood forest in the northern USA, DDS accounted for more than 90 % of the variation in spring canopy development (Richardson et al., 2006). In a cork oak provenances study (Sampaio et al., 2016), apart from a strong effect of the provenance origin, DDS was the strongest environmental determinant of the timing of budburst between different years. Interestingly, the budburst dates found in our study and in the Sampaio et al. (2016) study were similar for the same mild (DOY 107 and 105) and dry years (DOY 120 and 113). The impact of concurrent drought on tree phenology is scarcely mentioned in the literature and it seems to indicate only a minor and non-significant effect on budburst timing of Mediterranean trees (Ogaya and Penuelas, 2004; García-Mozo et al., 2010). Our results are in agreement with these studies, showing the major effect of temperature on the onset of phenological development, as well as the importance of spring temperatures fulfilling the temperature requirements for budburst (Fig. S1). Climate has been shown to account for more than 80 % of the variability of budburst day and growing season length in Mediterranean plants, mostly due to temperature, while precipitation only accounted for less than 10 % in that variability (Gordo and Sanz, 2010). In our study, water availability determined the growing season length. Cumulative precipitation was significantly lower in the dry year (Fig. 1a), which was actually the driest year in the last 140 years in the south-western Mediterranean (García-Herrera et al., 2007; Caldeira et al., 2015). The growing season length in the dry year, compared with the mild year, was more constrained by an earlier cessation of growth (−30 days), determined by water availability, than by a delayed budburst (+15 days), determined by temperature. The major influence of water availability is partly explained by the phenology of cork oak. In cork oak, leaf renewal (budburst and leaf senescence) occurs concurrently and in a short period during spring and early summer, which diverge from the more common pattern of spring budburst to autumn leaf senescence (Gordo and Sanz, 2010). Late spring and early summer correspond to the onset of the drought season that was anticipated in the severe drought year critically affecting the functioning of trees. Trunk growth started concomitantly with bud activity (Figs. 2 and 3), when temperatures increased, as already shown for cork oak trees (Oliveira et al., 1994) and other Mediterranean trees (Lempereur et al., 2015). Shoot elongation and trunk growth ceased earlier in the dry year and, interestingly, in a very synchronous way between trees in both years, as also reported by Oliveira et al. (1994). This observed synchrony suggests a trigger for growth cessation. A threshold of −1.0 MPa of leaf water potential, which was considered to be the onset of severe plant water stress, has been suggested to trigger growth cessation in cork oak (Pereira et al., 1987). A threshold of −1.1 MPa was recently suggested for growth cessation of Q. ilex (Lempereur et al., 2015). In our study, growth ceased at interpolated Ψpd values of −0.84 and −1.33 MPa, for mild and dry year, respectively, which suggests some acclimation to the precipitation conditions of the year. As Ψpd reflects soil water availability for trees, it integrates the cumulated precipitation and appears to be a suitable trigger of growth cessation in water-limited ecosystems, as already suggested by Pinto et al. (2011). In our study, growth ceased at significantly lower Ψpd in the dry year compared with the mild year (Fig. 5a) but at a similar carbon assimilation rate (Fig. 5b). This points to a possible carbon limitation for growth driven by stomatal closure, which occurred earlier in the dry year induced by drought (Besson et al., 2014). Nevertheless, the divergent values of Ψpd call attention to a trigger other than Ψpd of growth cessation in the mild year. The high vapour pressure deficit (VPD) observed at the end of the growing season in the mild year (Fig. S8), by triggering stomatal closure, was probably the trigger of growth cessation. It was recently demonstrated that elevated VPD limits tree growth (Sanginés de Cárcer et al., 2018). The authors proposed a VPD threshold of 15 hPa and concluded that the sensitivity to VPD is species-specific due to different tolerance thresholds. The time frame of this study is narrow, and longer studies are needed to fully understand the interactive effects of precipitation and temperature on triggering growth cessation. The leaf senescence period was reported to be smaller than the shoot growth period (Pereira et al., 1987) as observed in the mild year in our study (Fig. 2), besides some leaf senescence registered before the bulk period (Fig. 3), which is probably due to strong rain events. In the dry year, the bulk of leaf senescence was the longer phenophase (Fig. 2), ceasing later than shoot or trunk growth. Losing more leaves for a longer period may be a response to drought, as by shedding older leaves, trees prevent water loss (Pereira et al., 2009) and/or as a nitrogen conservation strategy. The lower [Nse], observed at the end of the bulk period in the dry year, suggests that trees were able to recycle N likely by shedding leaves for a longer period. By increasing NRE, hence increasing N concentration in current-year leaves, trees may have mitigated the negative effects of drought on N acquisition (Fig. S4), as discussed below. Mediterranean evergreen trees take advantage of every favourable environmental condition for carbon assimilation and growth (Larcher, 2000). Our data clearly show this, as trees had higher carbon assimilation rates (Fig. 5) while water was still not limiting, as indicated by predawn leaf water potential. Drought, by first decreasing cell turgor, primarily affects growth (Taiz and Zeiger, 1998). Stomatal closure occurs next, limiting carbon assimilation while preventing water loss (Chaves, 1991; Chaves et al., 2016). A strong stomatal control is an important feature of cork oak that allows it to withstand long periods of water shortage, which is closely linked to carbon assimilation (Otieno et al., 2007; Grant et al., 2010; Vaz et al., 2010; Pinto et al., 2012; Besson et al., 2014), corresponding to drought avoidance or isohydric behaviour. Amax, which responds to short-term weather conditions, was, at the onset of growth, significantly related to spring BAI. However, Amax only explained 18 % of the variability observed in BAI. The weakness of the relationship may reflect the allocation of carbon, not only for trunk growth but also for the roots and canopy. In fact, a deep rooting system is of major importance for cork oak during summer (David et al., 2013) and constitutes a considerable sink of carbon reserves (Mendes et al., 2016). Growth was intrinsically linked to phenology dynamics, in which the duration of the phenophases exerted a major control (Fig. 3). This was particularly true regarding trunk growth, given the same growth rate over a shorter period in the dry year (Fig. 3d). In a drought manipulation study with Q. ilex, growth duration was the best predictor of BAI (Lempereur et al., 2015). In our study, spring BAI was also positively correlated with trunk growth duration, while it reduced roughly in the same proportion as precipitation, when comparing the dry year with the mild year (−36 % and −30 %, for BAI and precipitation, respectively). 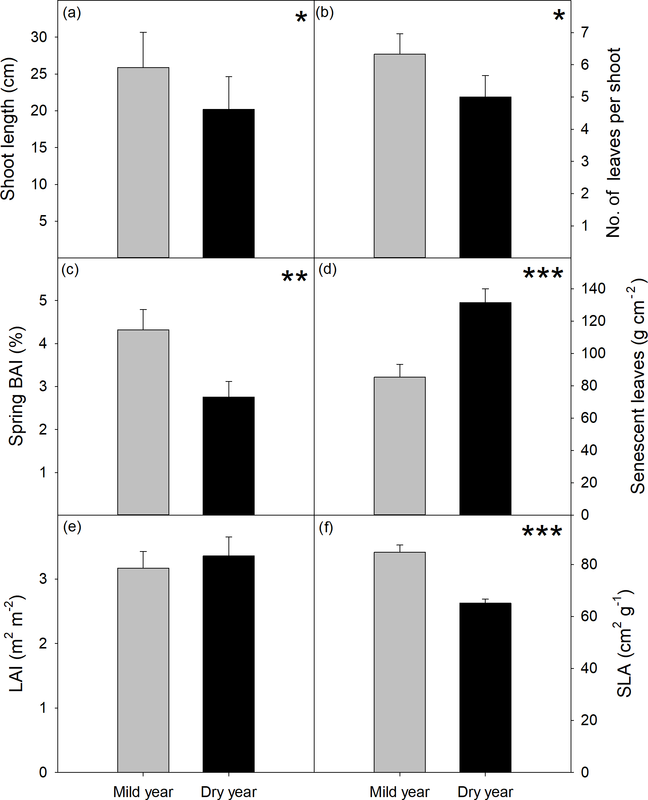 In turn, trunk growth duration and shoot elongation duration were positively correlated, as well as BAI with shoot length. Nevertheless, shoot elongation was less inhibited by drought (−22 %) than BAI. Despite the severe drought observed, the shoot length in our study was considerably higher than that reported in another study with juvenile cork oak trees (Oliveira et al., 1994), in which values ranged between 1.8 and 6.2 cm yr−1. This probably has to do with the fact that the sampled branches in that study were not clearly defined as apical, as we measured, thus showing lower growth. The lower reduction in shoot elongation in comparison to trunk growth, combined with an absence of significant changes in LAI, suggests that leaf carbon assimilation is privileged in cork oak because leaf area is maintained, as suggested elsewhere (Costa-e-Silva et al., 2015). Although reported LAI or litterfall responses to drought are conflicting (Reichstein et al., 2002; Ogaya and Penuelas, 2004; Limousin et al., 2009; Martin-StPaul et al., 2013; Costa-e-Silva et al., 2015), we would expect a reduction in LAI as a consequence of lower shoot elongation and a lower number of leaves, without a corresponding decrease in total litterfall. Despite the higher leaf senescence observed during the bulk period in the dry year, total litterfall (from January to September) was similar between years (Fig. 3e). This could be explained by trees retaining a portion of leaves in the canopy longer than a year or simply because litterfall reflects the growth of the previous year, which was not affected by drought. Similarly, in a study realized in the Mediterranean region, no changes were observed in Q. ilex litterfall between the same years (Limousin et al., 2009). The observed reduction in SLA is another characteristic response of Mediterranean trees to drought (Chaves and Oliveira, 2004). By limiting the transpiring area, trees will be able to keep photosynthetic activity for a longer period, as suggested by Ramírez-Valiente et al. (2010). More sclerophyllous leaves were also associated with low soil nutrient availability (Salleo and Nardini, 2000) due to their higher ratio of carbon to nitrogen. Short-term interactions between precipitation and temperature are complex (Gerst et al., 2017; Lempereur et al., 2017). The higher rate of shoot elongation observed in the dry year and the longer duration of shoot elongation in the mild year suggest, respectively, a positive effect temperature early in the growing season but a negative or null effect during the elongation period in the mild year, supported by the cessation of shoot elongation at a higher Ψpd. A longer study period would be required to get reliable conclusions. Cork oak trees “used water sparingly” (Pereira et al., 2009) and spring precipitation was of utmost importance for growth in the dry year, which is in agreement with other studies (Besson et al., 2014; Costa et al., 2016; Oliveira et al., 2016). In contrast, for the mild year, the cumulated precipitation allowed for a longer growing period and consequently higher tree growth, irrespective of a warmer and drier spring (Figs. 1 and S1). A decrease in soil N availability is an expected consequence of drought (Sardans et al., 2008), which might be aggravated by the forecasted changes in precipitation regimes (Rodríguez et al., 2019), leading to decreased [Ngr] (Fig. 6a) (Delarco et al., 1991). The variation in [Ngr] in the mild year was within the same range of values as those observed in other studies (Delarco et al., 1991; Escudero et al., 1992; Oliveira et al., 1996; Kattge et al., 2011). Nonetheless, Andivia et al. (2009) reported a higher variation in [Ngr] over the growing season. Nitrogen concentration in senescent leaves [Nse], known as resorption proficiency (Killingbeck, 1996) decreased steeply from the onset to the end of the bulk period of leaf senescence (Figs. 6b, S4). Silla and Escudero (2003), studying the internal N cycling of Q. ilex, observed that after budburst, plants firstly relied on soil uptake and later on N resorption to supply growth requirements, which might explain our results. A simpler explanation lies on the fact that the first leaves shed by the tree were not senescent yet; thus N was incompletely resorbed from them. More importantly, [Nse] decreased significantly in the dry year, reaching minimum values around 5.27±0.12 mg g−1. Minimum reported resorption proficiency for oaks was 4.5 mg g−1 and trees with [Nse] lower than 7 mg g−1 were considered highly proficient (Killingbeck, 1996). According to what was exposed, the resorption observed in cork oak was highly proficient and the lowest values of [Nse] observed at the end of the senescence period in the dry year suggest the maximum resorption for cork oak trees. An increase in nitrogen resorption from senescent leaves is a recognized feature of Mediterranean plants (Andivia et al., 2009; Sardans and Peñuelas, 2013) and is a key feature of nutrient conservation strategies (Vergutz et al., 2012; Brant and Chen, 2015; Xu et al., 2017). Cork oak has been reported to resorb more N than the average Mediterranean woody species (Delarco et al., 1991). The NRE in the dry year (63 %) was higher than the values reported for evergreen trees (47 % or 56 %) (Aerts, 1996; Vergutz et al., 2012) or for cork oak (48 % or 52 %) (Delarco et al., 1991; Escudero et al., 1992), the latter being similar to NRE in the mild year (54 %) in our study. Cork oak significantly increased NRE (+22 %) with drought (Fig. 6c) and, by doing this, mitigated the effects of drought on N uptake from soils, as [Ngr] at the end of the growing period was similar between years (Fig. 6a). We found no general correlation between [Ngr] and [Nse], nor between NRE and [Ngr] during leaf senescence. NRE was only highly significantly and negatively correlated with [Nse]. These findings underline the lack of nutritional control on NRE (Aerts and Chapin, 1999), as previously reported (Delarco et al., 1991; Aerts, 1996; Kazakou et al., 2007), despite recent studies having identified leaf nutrient status as the major control of NRE (Kobe et al., 2005; Vergutz et al., 2012; Zhao et al., 2017). Rather, the major control on NRE was exerted by nutrient proficiency, as observed elsewhere (Kazakou et al., 2007). Although nutrient resorption can vary significantly from year to year (Killingbeck, 2004), it has been considered a possible adaptive trait (Vergutz et al., 2012). Our data confirm this last statement. This study reports changes in tree phenology in response to a naturally occurring extreme drought. As far as we are aware, this study was the first to integrate the timing and duration of several phenophases with growth, while using green and leaf senescent to assess leaf nitrogen dynamics during the growing period. Our results confirmed temperature as a major driver of budburst, yet drought severely constrained tree growth, mainly by strongly reducing the growing season length. The different dynamics observed in shoot elongation, in contrast with the other phenophases, are indicative that cork oak privileges leaf area development, while all other phases develop at the same rate. Notably, the nitrogen resorption efficiency from senescent to green leaves increased as a response to drought. A higher nitrogen resorption efficiency in response to drought may clearly improve tree fitness in the short term but is likely to exert a negative feedback on the nitrogen cycle which might affect ecosystem functioning in the long term under the forecasted increasing occurrence of droughts. We are aware that the time frame of this study is narrow and longer studies are needed to confirm our results and to understand the interactive effects of warming and heatwaves with drought on the phenology and growth of Mediterranean trees. Nevertheless, our study shows the dynamics of the different vegetative phenophases, which cannot be assessed by ring-width analysis but contribute to a deeper understanding of Mediterranean trees' responses to drought. Finally, the sensitivity of phenology to climate change has implications for land management, including adaptation measures (Richardson et al., 2013; Han et al., 2018) to mitigate the deleterious effects of climate change. The supplement related to this article is available online at: https://doi.org/10.5194/bg-16-1265-2019-supplement. RLdV performed fieldwork, data analysis, and wrote the manuscript. CKB planned the experiment, performed fieldwork and contributed to writing the manuscript. MCC assisted in the interpretation of the data and contributed to writing the manuscript. All authors critically discussed and reviewed the manuscript. This work is a product of a postdoctoral fellowship of Portuguese FCT to Raquel Lobo-do-Vale (SFRH/BPD/86938/2012), and FCT project grant to Cathy Kurz Besson (PIEZAGRO, PTDC/AAG-REC/7046/2014). It was previously supported by the EU project MIND-EVK2-CT-2002-00158 (Mediterranean terrestrial ecosystems and INcreasing Drought: vulnerability assessment). Centro de Estudos Florestais (CEF) and Instituto Dom Luiz are research units funded by FCT (UID/AGR/00239/2013 and UID/GEO/50019/2013, respectively). We are very grateful to Alastair Herd, André Pestana, Carla Nogueira, Elisabete Marianito, Elsa Breia, João Banza, and Pedro Almeida for their support for field installation, site maintenance and/or field measurements. This paper was edited by Frank Hagedorn and reviewed by three anonymous referees. Aerts, R.: Nutrient Resorption from Senescing Leaves of Perennials: Are there General Patterns?, J. Ecol., 84, 597–608, https://doi.org/10.2307/2261481, 1996. Aerts, R. and Chapin, F. S.: The Mineral Nutrition of Wild Plants Revisited: A Re-evaluation of Processes and Patterns, Adv. Ecol. Res., 30, 1–67, https://doi.org/10.1016/S0065-2504(08)60016-1, 1999. Andivia, E., Fernández, M., Vázquez-Piqué, J., González-Pérez, A., and Tapias, R.: Nutrients return from leaves and litterfall in a mediterranean cork oak (Quercus suber L.) forest in southwestern Spain, Eur. J. Forest Res., 129, 5–12, https://doi.org/10.1007/s10342-009-0274-6, 2009. Aronson, J., Pereira, J. S., and Pausas, J. G.: Cork oak woodlands on the edge: Ecology, adaptive management and restoration, The science and practice of ecological restoration, edited by: International, S. f. E. R., IslandPress, Washington, 315 pp., 2009. Banimahd, S. A. and Khalili, D.: Factors Influencing Markov Chains Predictability Characteristics, Utilizing SPI, RDI, EDI and SPEI Drought Indices in Different Climatic Zones, Water Resour. Manag., 27, 3911–3928, https://doi.org/10.1007/s11269-013-0387-z, 2013. Besson, C. K., Lobo-do-Vale, R., Rodrigues, M. L., Almeida, P., Herd, A., Grant, O. M., David, T. S., Schmidt, M., Otieno, D., Keenan, T. F., Gouveia, C., Mériaux, C., Chaves, M. M., and Pereira, J. S.: Cork oak physiological responses to manipulated water availability in a Mediterranean woodland, Agr. Forest Meteorol., 184, 230–242, https://doi.org/10.1016/j.agrformet.2013.10.004, 2014. Brant, A. N. and Chen, H. Y. H.: Patterns and Mechanisms of Nutrient Resorption in Plants, CRC Cr. Rev. Plant Sci., 34, 471–486, https://doi.org/10.1080/07352689.2015.1078611, 2015. Bussotti, F., Ferrini, F., Pollastrini, M., and Fini, A.: The challenge of Mediterranean sclerophyllous vegetation under climate change: From acclimation to adaptation, Environ. Exp. Bot., 103, 80–98, https://doi.org/10.1016/j.envexpbot.2013.09.013, 2014. Caldeira, M. C., Lecomte, X., David, T. S., Pinto, J. G., Bugalho, M. N., and Werner, C.: Synergy of extreme drought and shrub invasion reduce ecosystem functioning and resilience in water-limited climates, Sci. Rep., 5, 15110, https://doi.org/10.1038/srep15110, 2015. Camilo-Alves, C. S. P., Clara, M. I. E., and Ribeiro, N. M. C. A.: Decline of Mediterranean oak trees and its association with Phytophthora cinnamomi: a review, Eur. J. Forest Res., 132, 411–432, https://doi.org/10.1007/s10342-013-0688-z, 2013. Cannell, M. G. R. and Smith, R. I.: Thermal Time, Chill Days and Prediction of Budburst in Picea sitchensis, J. Appl. Ecol., 20, 951–963, https://doi.org/10.2307/2403139, 1983. Chaves, M. M.: Effects of Water Deficits on Carbon Assimilation, J. Exp. Bot., 42, 1–16, https://doi.org/10.1093/jxb/42.1.1, 1991. Chaves, M. M. and Oliveira, M. M.: Mechanisms underlying plant resilience to water deficits: prospects for water-saving agriculture, J. Exp. Bot., 55, 2365–2384, https://doi.org/10.1093/jxb/erh269, 2004. Chaves, M. M., Costa, J. M., Zarrouk, O., Pinheiro, C., Lopes, C. M., and Pereira, J. S.: Controlling stomatal aperture in semi-arid regions – The dilemma of saving water or being cool?, Plant Sci., 251, 54–64, https://doi.org/10.1016/j.plantsci.2016.06.015, 2016. IPMA: Climate normals, available at: http://www.ipma.pt, last access: 15 January 2018. Costa, A., Pereira, H., and Oliveira, Â.: Influence of climate on the seasonality of radial growth of cork oak during a cork production cycle, Ann. Forest Sci., 59, 429–437, https://doi.org/10.1051/forest:2002017, 2002. Costa, A., Madeira, M., Santos, J. L., and Oliveira, A.: Change and dynamics in Mediterranean evergreen oak woodlands landscapes of Southwestern Iberian Peninsula, Landscape Urban Plan., 102, 164–176, https://doi.org/10.1016/j.landurbplan.2011.04.002, 2011. Costa, A., Barbosa, I., Roussado, C., Graça, J., and Spiecker, H.: Climate response of cork growth in the Mediterranean oak (Quercus suber L.) woodlands of southwestern Portugal, Dendrochronologia, 38, 72–81, https://doi.org/10.1016/j.dendro.2016.03.007, 2016. Costa-e-Silva, F., Correia, A. C., Piayda, A., Dubbert, M., Rebmann, C., Cuntz, M., Werner, C., David, J. S., and Pereira, J. S.: Effects of an extremely dry winter on net ecosystem carbon exchange and tree phenology at a cork oak woodland, Agr. Forest Meteorol., 204, 48–57, https://doi.org/10.1016/j.agrformet.2015.01.017, 2015. David, T. S., Pinto, C. A., Nadezhdina, N., Kurz-Besson, C., Henriques, M. O., Quilhó, T., Cermak, J., Chaves, M. M., Pereira, J. S., and David, J. S.: Root functioning, tree water use and hydraulic redistribution in Quercus suber trees: A modeling approach based on root sap flow, Forest Ecol. Manag., 307, 136–146, https://doi.org/10.1016/j.foreco.2013.07.012, 2013. Delarco, J. M., Escudero, A., and Garrido, M. V.: Effects of Site Characteristics on Nitrogen Retranslocation from Senescing Leaves, Ecology, 72, 701–708, https://doi.org/10.2307/2937209, 1991. 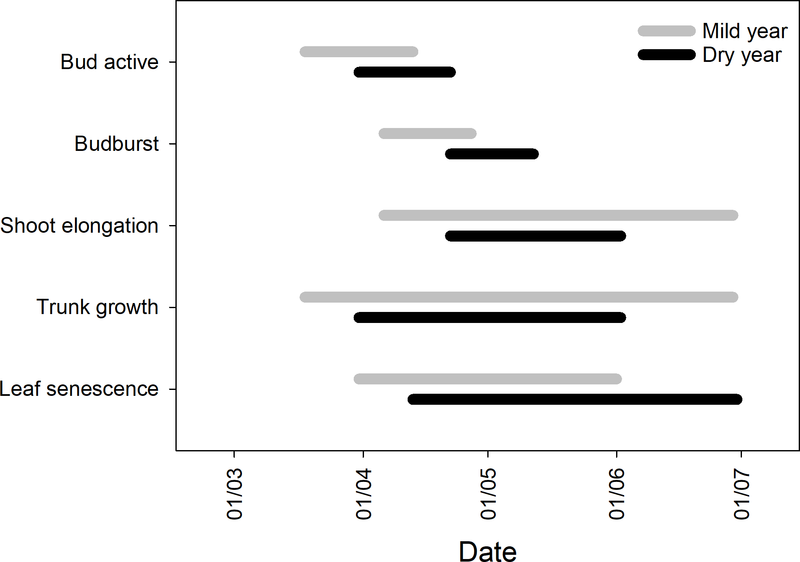 Diez, J. M., Ibáñez, I., J., M.-R. A., Mazer, S. J., Crimmins, T. M., Crimmins, M. A., Bertelsen, C. D., and Inouye, D. W.: Forecasting phenology: from species variability to community patterns, Ecol. Lett., 15, 545–553, https://doi.org/10.1111/j.1461-0248.2012.01765.x, 2012. Doblas-Miranda, E., Martínez-Vilalta, J., Lloret, F., Álvarez, A., Ávila, A., Bonet, F. J., Brotons, L., Castro, J., Curiel Yuste, J., Díaz, M., Ferrandis, P., García-Hurtado, E., Iriondo, J. M., Keenan, T. F., Latron, J., Llusià, J., Loepfe, L., Mayol, M., Moré, G., Moya, D., Peñuelas, J., Pons, X., Poyatos, R., Sardans, J., Sus, O., Vallejo, V. R., Vayreda, J., and Retana, J.: Reassessing global change research priorities in Mediterranean terrestrial ecosystems: how far have we come and where do we go from here?, Global Ecol. Biogeogr., 24, 25–43, https://doi.org/10.1111/geb.12224, 2015. Drenovsky, R. E., Khasanova, A., and James, J. J.: Trait convergence and plasticity among native and invasive species in resource-poor environments, Am. J. Bot., 99, 629–639, https://doi.org/10.3732/ajb.1100417, 2012. Escudero, A., Arco, J. M. d., Sanz, I. C., and Ayala, J.: Effects of leaf longevity and retranslocation efficiency on the retention time of nutrients in the leaf biomass of different woody species, Oecologia, 90, 80–87, https://doi.org/10.1007/BF00317812, 1992. Finzi, A. C., Allen, A. S., DeLucia, E. H., Ellsworth, D. S., and Schlesinger, W. H.: Forest litter production, chemistry, and decomposition following two years of free-air CO2 enrichment, Ecology, 82, 470–484, 2001. Fioretto, A., Papa, S., and Fuggi, A.: Litter-fall and litter decomposition in a low Mediterranean shrubland, Biol. Fert. Soils, 39, 37–44, https://doi.org/10.1007/s00374-003-0675-5, 2003. Flynn, D. F. B. and Wolkovich, E. M.: Temperature and photoperiod drive spring phenology across all species in a temperate forest community, New Phytol., 219, 1353–1362, https://doi.org/10.1111/nph.15232, 2018. García-Herrera, R., Hernández, E., Barriopedro, D., Paredes, D., Trigo, R. M., Trigo, I. F., and Mendes, M. A.: The Outstanding 2004/05 Drought in the Iberian Peninsula: Associated Atmospheric Circulation, J. Hydrometeorol., 8, 483–498, https://doi.org/10.1175/jhm578.1, 2007. García-Mozo, H., Mestre, A., and Galán, C.: Phenological trends in southern Spain: A response to climate change, Agr. Forest Meteorol., 150, 575–580, https://doi.org/10.1016/j.agrformet.2010.01.023, 2010. Gerst, K. L., Rossington, N. L., and Mazer, S. J.: Phenological responsiveness to climate differs among four species of Quercus in North America, J. Ecol., 105, 1610–1622, https://doi.org/10.1111/1365-2745.12774, 2017. Giorgi, F. and Lionello, P.: Climate change projections for the Mediterranean region, Glob. Planet. Change, 63, 90–104, https://doi.org/10.1016/j.gloplacha.2007.09.005, 2008. Gordo, O. and Sanz, J. J.: Long-term temporal changes of plant phenology in the Western Mediterranean, Glob. Change Biol., 15, 1930–1948, https://doi.org/10.1111/j.1365-2486.2009.01851.x, 2009. Gordo, O. and Sanz, J. J.: Impact of climate change on plant phenology in Mediterranean ecosystems, Glob. Change Biol., 16, 1082–1106, https://doi.org/10.1111/j.1365-2486.2009.02084.x, 2010. Grant, O. M., Tronina, L., Ramalho, J. C., Besson, C. K., Lobo-do-Vale, R., Pereira, J. S., Jones, H. G., and Chaves, M. M.: The impact of drought on leaf physiology of Quercus suber L. trees: comparison of an extreme drought event with chronic rainfall reduction, J. Exp. Bot., 61, 4361–4371, https://doi.org/10.1093/Jxb/Erq239, 2010. Han, Q., Wang, T., Jiang, Y., Fischer, R., and Li, C.: Phenological variation decreased carbon uptake in European forests during 1999–2013, Forest Ecol. Manag., 427, 45–51, https://doi.org/10.1016/j.foreco.2018.05.062, 2018. Jacob, D., Petersen, J., Eggert, B., Alias, A., Christensen, O., Bouwer, L., Braun, A., Colette, A., Déqué, M., Georgievski, G., Georgopoulou, E., Gobiet, A., Menut, L., Nikulin, G., Haensler, A., Hempelmann, N., Jones, C., Keuler, K., Kovats, S., Kröner, N., Kotlarski, S., Kriegsmann, A., Martin, E., van Meijgaard, E., Moseley, C., Pfeifer, S., Preuschmann, S., Radermacher, C., Radtke, K., Rechid, D., Rounsevell, M., Samuelsson, P., Somot, S., Soussana, J.-F., Teichmann, C., Valentini, R., Vautard, R., Weber, B., and Yiou, P.: EURO-CORDEX: new high-resolution climate change projections for European impact research, Reg. Environ. Change, 14, 563–578, https://doi.org/10.1007/s10113-013-0499-2, 2014. Jeong, S.-J., Ho, C.-H., Gim, H.-J., and Brown, M. E.: Phenology shifts at start vs. end of growing season in temperate vegetation over the Northern Hemisphere for the period 1982–2008, Glob. Change Biol., 17, 2385–2399, https://doi.org/10.1111/j.1365-2486.2011.02397.x, 2011. Joffre, R., Gillon, D., Dardenne, P., Agneessens, R., and Biston, R.: The use of near-infrared reflectance spectroscopy in litter decomposition studies, Ann. Sci. Forest, 49, 481–488, https://doi.org/10.1051/forest:19920504, 1992. Kattge, J., Díaz, S., Lavorel, S., Prentice, I. C., Leadley, P., BÖNisch, G., Garnier, E., Westoby, M., Reich, P. B., Wright, I. J., Cornelissen, J. H. C., Violle, C., Harrison, S. P., Van Bodegom, P. M., Reichstein, M., Enquist, B. J., Soudzilovskaia, N. A., Ackerly, D. D., Anand, M., Atkin, O., Bahn, M., Baker, T. R., Baldocchi, D., Bekker, R., Blanco, C. C., Blonder, B., Bond, W. J., Bradstock, R., Bunker, D. E., Casanoves, F., Cavender-Bares, J., Chambers, J. Q., Chapin Iii, F. S., Chave, J., Coomes, D., Cornwell, W. K., Craine, J. M., Dobrin, B. H., Duarte, L., Durka, W., Elser, J., Esser, G., Estiarte, M., Fagan, W. F., Fang, J., FernÁNdez-MÉNdez, F., Fidelis, A., Finegan, B., Flores, O., Ford, H., Frank, D., Freschet, G. T., Fyllas, N. M., Gallagher, R. V., Green, W. A., Gutierrez, A. G., Hickler, T., Higgins, S. I., Hodgson, J. G., Jalili, A., Jansen, S., Joly, C. A., Kerkhoff, A. J., Kirkup, D., Kitajima, K., Kleyer, M., Klotz, S., Knops, J. M. H., Kramer, K., KÜHn, I., Kurokawa, H., Laughlin, D., Lee, T. D., Leishman, M., Lens, F., Lenz, T., Lewis, S. L., Lloyd, J., LlusiÀ, J., Louault, F., Ma, S., Mahecha, M. D., Manning, P., Massad, T., Medlyn, B. E., Messier, J., Moles, A. T., MÜLler, S. C., Nadrowski, K., Naeem, S., Niinemets, Ü., NÖLlert, S., NÜSke, A., Ogaya, R., Oleksyn, J., Onipchenko, V. G., Onoda, Y., OrdoÑEz, J., Overbeck, G., Ozinga, W. A., Patiño, S., Paula, S., Pausas, J. G., PeÑUelas, J., Phillips, O. L., Pillar, V., Poorter, H., Poorter, L., Poschlod, P., Prinzing, A., Proulx, R., Rammig, A., Reinsch, S., Reu, B., Sack, L., Salgado-Negret, B., Sardans, J., Shiodera, S., Shipley, B., Siefert, A., Sosinski, E., Soussana, J. F., Swaine, E., Swenson, N., Thompson, K., Thornton, P., Waldram, M., Weiher, E., White, M., White, S., Wright, S. J., Yguel, B., Zaehle, S., Zanne, A. E., and Wirth, C.: TRY – a global database of plant traits, Glob. Change Biol., 17, 2905–2935, 10.1111/j.1365-2486.2011.02451.x, 2011. Kazakou, E., Garnier, E., Navas, M.-L., Roumet, C., Collin, C., and Laurent, G.: Components of nutrient residence time and the leaf economics spectrum in species from Mediterranean old-fields differing in successional status, Funct. Ecol., 21, 235–245, https://doi.org/10.1111/j.1365-2435.2006.01242.x, 2007. Khasanova, A., James, J. J., and Drenovsky, R. E.: Impacts of drought on plant water relations and nitrogen nutrition in dryland perennial grasses, Plant Soil, 372, 541–552, https://doi.org/10.1007/s11104-013-1747-4, 2013. Killingbeck, K.: Nutrients in Senesced Leaves: Keys to the Search for Potential Resorption and Resorption Proficiency, Ecology, 77, 1716–1727, https://doi.org/10.2307/2265777, 1996. Killingbeck, K. T.: 14 – Nutrient Resorption, in: Plant Cell Death Processes, edited by: Noodén, L. D., Academic Press, San Diego, 215–226, 2004. Kobe, R. K., Lepczyk, C. A., and Iyer, M.: Resorption efficiency decreases with increasing green leaf nutrients in a global data set, Ecology, 86, 2780–2792, https://doi.org/10.1890/04-1830, 2005. Körner, C. and Basler, D.: Phenology Under Global Warming, Science, 327, 1461–1462, https://doi.org/10.1126/science.1186473, 2010. Larcher, W.: Temperature stress and survival ability of Mediterranean sclerophyllous plants, Plant Biosyst., 134, 279–295, https://doi.org/10.1080/11263500012331350455, 2000. Lempereur, M., Martin-StPaul, N. K., Damesin, C., Joffre, R., Ourcival, J.-M., Rocheteau, A., and Rambal, S.: Growth duration is a better predictor of stem increment than carbon supply in a Mediterranean oak forest: implications for assessing forest productivity under climate change, New Phytol., 207, 579–590, https://doi.org/10.1111/nph.13400, 2015. Lempereur, M., Limousin, J.-M., Guibal, F., Ourcival, J.-M., Rambal, S., Ruffault, J., and Mouillot, F.: Recent climate hiatus revealed dual control by temperature and drought on the stem growth of Mediterranean Quercus ilex, Glob. Change Biol., 23, 42–55, https://doi.org/10.1111/gcb.13495, 2017. Limousin, J. M., Rambal, S., Ourcival, J. M., Rocheteau, A., Joffre, R., and Rodriguez-Cortina, R.: Long-term transpiration change with rainfall decline in a Mediterranean Quercus ilex forest, Glob. Change Biol., 15, 2163–2175, https://doi.org/10.1111/j.1365-2486.2009.01852.x, 2009. Martin-StPaul, N. K., Limousin, J.-M., Vogt-Schilb, H., Rodríguez-Calcerrada, J., Rambal, S., Longepierre, D., and Misson, L.: The temporal response to drought in a Mediterranean evergreen tree: comparing a regional precipitation gradient and a throughfall exclusion experiment, Glob. Change Biol., 19, 2413–2426, https://doi.org/10.1111/gcb.12215, 2013. Mendes, M. P., Ribeiro, L., David, T. S., and Costa, A.: How dependent are cork oak (Quercus suber L.) woodlands on groundwater? A case study in southwestern Portugal, Forest Ecol. Manag., 378, 122–130, https://doi.org/10.1016/j.foreco.2016.07.024, 2016. Menzel, A., Sparks, T. H., Estrella, N., Koch, E., Aasa, A., Ahas, R., Alm-Kubler, K., Bissolli, P., Braslavska, O. g., Briede, A., Chmielewski, F. M., Crepinsek, Z., Curnel, Y., Dahl, A., Defila, C., Donnelly, A., Filella, Y., Jatczak, K., Mage, F., Mestre, A., Nordli, O., Penuelas, J., Pirinen, P., Remisova, V., Scheifinger, H., Striz, M., Susnik, A., Van Vliet, A. J. H., Wielgolaski, F.-E., Zach, S., and Zust, A.: European phenological response to climate change matches the warming pattern, Glob. Change Biol., 12, 1969–1976, https://doi.org/10.1111/j.1365-2486.2006.01193.x, 2006. 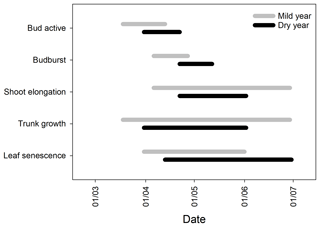 Misson, L., Degueldre, D., Collin, C., Rodriguez, R., Rocheteau, A., Ourcival, J.-M., and Rambal, S.: Phenological responses to extreme droughts in a Mediterranean forest, Glob. Change Biol., 17, 1036–1048, https://doi.org/10.1111/j.1365-2486.2010.02348.x, 2011. Natividade, J. V.: Subericultura, Direcção Geral dos Serviços Florestais e Aquícolas, Lisboa, 387 pp., 1950. Niinemets, Ü.: Responses of forest trees to single and multiple environmental stresses from seedlings to mature plants: Past stress history, stress interactions, tolerance and acclimation, Forest Ecol. Manag., 260, 1623–1639, https://doi.org/10.1016/j.foreco.2010.07.054, 2010. Niinemets, Ü. and Keenan, T.: Photosynthetic responses to stress in Mediterranean evergreens: Mechanisms and models, Environ. Exp. Bot., 103, 24–41, https://doi.org/10.1016/j.envexpbot.2013.11.008, 2014. Ogaya, R. and Penuelas, J.: Phenological patterns of Quercus ilex, Phillyrea latifolia, and Arbutus unedo growing under a field experimental drought, Ecoscience, 11, 263–270, https://doi.org/10.1080/11956860.2004.11682831, 2004. Oliveira, G., Correia, O., Martins Loucao, M., and Catarino, F. M.: Phenological and growth patterns of the Mediterranean oak Quercus suber L., Trees-Struct. Funct., 9, 41–46, https://doi.org/10.1007/BF00197868, 1994. Oliveira, G., MartinsLoucao, M. A., Correia, O., and Catarino, F.: Nutrient dynamics in crown tissues of cork-oak (Quercus suber L.), Trees-Struct. Funct., 10, 247–254, https://doi.org/10.1007/BF02185676, 1996. 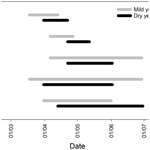 Oliveira, V., Lauw, A., and Pereira, H.: Sensitivity of cork growth to drought events: insights from a 24-year chronology, Climatic Change, 137, 261–274, https://doi.org/10.1007/s10584-016-1680-7, 2016. Otieno, D. O., Schmidt, M. W. T., Kurz-Besson, C., Lobo-do-Vale, R., Pereira, J. S., and Tenhunen, J. D.: Regulation of transpirational water loss in Quercus suber trees in a Mediterranean-type ecosystem, Tree Physiol., 27, 1179–1187, https://doi.org/10.1093/treephys/27.8.1179, 2007. 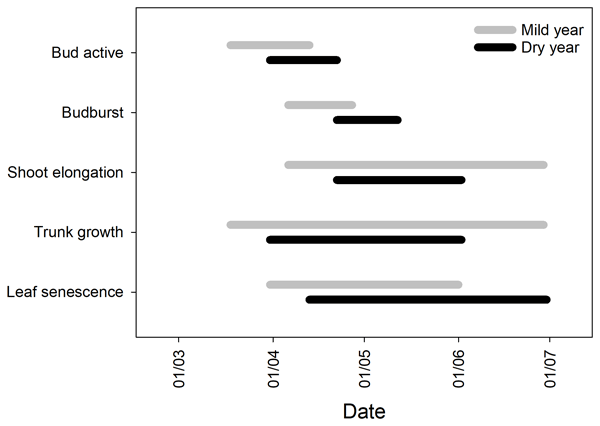 Penuelas, J., Filella, I., Zhang, X. Y., Llorens, L., Ogaya, R., Lloret, F., Comas, P., Estiarte, M., and Terradas, J.: Complex spatiotemporal phenological shifts as a response to rainfall changes, New Phytol., 161, 837–846, https://doi.org/10.1111/j.1469-8137.2004.01003.x, 2004. Peñuelas, J., Filella, I., and Comas, P.: Changed plant and animal life cycles from 1952 to 2000 in the Mediterranean region, Glob. Change Biol., 8, 531–544, https://doi.org/10.1046/j.1365-2486.2002.00489.x, 2002. Pereira, J. S., Beyschlag, G., Lange, O. L., Beyschlag, W., and Tenhunen, J. D.: Comparative phenology of four mediterranean shrub species growing in Portugal, in: Plant Responses to Stress, edited by: Tenhunen, J. D., Catarino, F. M., Lange, O. L., and Oechel, W. C., NATO ASI Series, Springer-Verlag, Berlin Heidelberg, 503–513, 1987. Pereira, J. S., Mateus, J. A., Aires, L. M., Pita, G., Pio, C., David, J. S., Andrade, V., Banza, J., David, T. S., Paco, T. A., and Rodrigues, A.: Net ecosystem carbon exchange in three contrasting Mediterranean ecosystems – the effect of drought, Biogeosciences, 4, 791–802, https://doi.org/10.5194/bg-4-791-2007, 2007. Pereira, J. S., Kurz-Besson, C., and Chaves, M. M.: Coping with drought, in: Cork Oak Woodlands on the Edge: Ecology, Adaptive Management, and Restoration. Part II. Scientific Bases for Restoration and Management, edited by: Aronson, J., Pereira, J. S., and Pausas, J. G., Island Press, Washington DC, 73–80, 2009. Perkins-Kirkpatrick, S. E. and Gibson, P. B.: Changes in regional heatwave characteristics as a function of increasing global temperature, Sci. Rep., 7, 12256, https://doi.org/10.1038/s41598-017-12520-2, 2017. Pinto, C. A., Henriques, M. O., Figueiredo, J. P., David, J. S., Abreu, F. G., Pereira, J. S., Correia, I., and David, T. S.: Phenology and growth dynamics in Mediterranean evergreen oaks: Effects of environmental conditions and water relations, Forest Ecol. Manag., 262, 500–508, https://doi.org/10.1016/j.foreco.2011.04.018, 2011. Pinto, C. A., David, J. S., Cochard, H., Caldeira, M. C., Henriques, M. O., Quilhó, T., Paço, T. A., Pereira, J. S., and David, T. S.: Drought-induced embolism in current-year shoots of two Mediterranean evergreen oaks, Forest Ecol. Manag., 285, 1–10, https://doi.org/10.1016/j.foreco.2012.08.005, 2012. Polgar, C. A. and Primack, R. B.: Leaf-out phenology of temperate woody plants: from trees to ecosystems, New Phytol., 191, 926–941, https://doi.org/10.1111/j.1469-8137.2011.03803.x, 2011. Ramírez-Valiente, J. A., Sánchez-Gómez, D., Aranda, I., and Valladares, F.: Phenotypic plasticity and local adaptation in leaf ecophysiological traits of 13 contrasting cork oak populations under different water availabilities, Tree Physiol., 30, 618–627, https://doi.org/10.1093/treephys/tpq013, 2010. Reichstein, M., Tenhunen, J. D., Roupsard, O., Ourcival, J. M., Rambal, S., Dore, S., and Valentini, R.: Ecosystem respiration in two Mediterranean evergreen Holm Oak forests: drought effects and decomposition dynamics, Funct. Ecol., 16, 27–39, https://doi.org/10.1046/j.0269-8463.2001.00597.x, 2002. Richardson, A. D., Bailey, A. S., Denny, E. G., Martin, C. W., and O'Keefe, J.: Phenology of a northern hardwood forest canopy, Glob. Change Biol., 12, 1174–1188, https://doi.org/10.1111/j.1365-2486.2006.01164.x, 2006. Richardson, A. D., Keenan, T. F., Migliavacca, M., Ryu, Y., Sonnentag, O., and Toomey, M.: Climate change, phenology, and phenological control of vegetation feedbacks to the climate system, Agr. Forest Meteorol., 169, 156–173, https://doi.org/10.1016/j.agrformet.2012.09.012, 2013. Rodríguez, A., Durán, J., Rey, A., Boudouris, I., Valladares, F., Gallardo, A., and Yuste, J. C.: Interactive effects of forest die-off and drying-rewetting cycles on C and N mineralization, Geoderma, 333, 81–89, https://doi.org/10.1016/j.geoderma.2018.07.003, 2019. Salleo, S. and Nardini, A.: Sclerophylly: Evolutionary advantage or mere epiphenomenon?, Plant Biosyst., 134, 247–259, https://doi.org/10.1080/11263500012331350435, 2000. Sampaio, T., Branco, M., Guichoux, E., Petit, R. J., Pereira, J. S., Varela, M. C., and Almeida, M. H.: Does the geography of cork oak origin influence budburst and leaf pest damage?, Forest Ecol. Manag., 373, 33–43, https://doi.org/10.1016/j.foreco.2016.04.019, 2016. Sanginés de Cárcer, P., Vitasse, Y., Peñuelas, J., Jassey, V. E. J., Buttler, A., and Signarbieux, C.: Vapor–pressure deficit and extreme climatic variables limit tree growth, Glob. Change Biol., 24, 1108–1122, https://doi.org/10.1111/gcb.13973, 2018. Sardans, J. and Peñuelas, J.: Plant-soil interactions in Mediterranean forest and shrublands: impacts of climatic change, Plant Soil, 365, 1–33, https://doi.org/10.1007/s11104-013-1591-6, 2013. Sardans, J., Peñuelas, J., Estiarte, M., and Prieto, P.: Warming and drought alter C and N concentration, allocation and accumulation in a Mediterranean shrubland, Glob. Change Biol., 14, 2304–2316, https://doi.org/10.1111/j.1365-2486.2008.01656.x, 2008. Silla, F. and Escudero, A.: Uptake, demand and internal cycling of nitrogen in saplings of Mediterranean Quercus species, Oecologia, 136, 28–36, https://doi.org/10.1007/s00442-003-1232-5, 2003. Swidrak, I., Schuster, R., and Oberhuber, W.: Comparing growth phenology of co-occurring deciduous and evergreen conifers exposed to drought, Flora – Morphology, Distribution, Funct. Ecol. Plants, 208, 609–617, https://doi.org/10.1016/j.flora.2013.09.004, 2013. Taiz, L. and Zeiger, E.: Plant physiology, 2nd edn., Sinauer Associates, Sunderland, Mass., 792 pp., 1998. Tang, J., Körner, C., Muraoka, H., Piao, S., Shen, M., Thackeray, S. J., and Yang, X.: Emerging opportunities and challenges in phenology: a review, Ecosphere, 7, e01436, https://doi.org/10.1002/ecs2.1436, 2016. Vaz, M., Pereira, J. S., Gazarini, L. C., David, T. S., David, J. S., Rodrigues, A., Maroco, J., and Chaves, M. M.: Drought-induced photosynthetic inhibition and autumn recovery in two Mediterranean oak species (Quercus ilex and Quercus suber), Tree Physiol., 30, 946–956, https://doi.org/10.1093/treephys/tpq044, 2010. Vergutz, L., Manzoni, S., Porporato, A., Novais, R. F., and Jackson, R. B.: Global resorption efficiencies and concentrations of carbon and nutrients in leaves of terrestrial plants, Ecol. Monogr., 82, 205–220, https://doi.org/10.1890/11-0416.1, 2012. Vicente Serrano, S. M., Beguería, S., López-Moreno, J. I., Angulo-Martínez, M., and El Kenawy, A. M.: A new global 0.5∘ gridded dataset (1901–2006) of a multiscalar drought index: comparison with current drought index datasets based on the Palmer Drought Severity Index, J. Hydrometeorol., 11, 1033–1043, https://doi.org/10.1175/2010JHM1224.1, 2010. Vitasse, Y., Delzon, S., Dufrêne, E., Pontailler, J.-Y., Louvet, J.-M., Kremer, A., and Michalet, R.: Leaf phenology sensitivity to temperature in European trees: Do within-species populations exhibit similar responses?, Agr. Forest Meteorol., 149, 735–744, https://doi.org/10.1016/j.agrformet.2008.10.019, 2009. Wang, Z., Fan, Z., Zhao, Q., Ran, J., and Niklas, K. J.: Global patterns of leaf nutrient resorption in herbaceous plants, Biogeosciences Discuss., https://doi.org/10.5194/bg-2018-112, 2018. Wright, I. J. and Westoby, M.: Nutrient concentration, resorption and lifespan: leaf traits of Australian sclerophyll species, Funct. Ecol., 17, 10–19, https://doi.org/10.1046/j.1365-2435.2003.00694.x, 2003. Xu, S., Zhou, G., Tang, X., Wang, W., Wang, G., Ma, K., Han, S., Du, S., Li, S., Yan, J., and Ma, Y.: Different spatial patterns of nitrogen and phosphorus resorption efficiencies in China's forests, Sci. Rep., 7, 10584, https://doi.org/10.1038/s41598-017-11163-7, 2017. Zhao, G., Shi, P., Wu, J., Xiong, D., Zong, N., and Zhang, X.: Foliar nutrient resorption patterns of four functional plants along a precipitation gradient on the Tibetan Changtang Plateau, Ecol. Evol., 7, 7201–7212, https://doi.org/10.1002/ece3.3283, 2017.